After spending the week couch-bound due to the lovely influenza bug, engaging in nothing more than distraction behaviours (binge watching TV and movies), I found myself judging my worth and abilities. My Inner Bully was having a field day. It seems inevitable that these bullies are going to keep showing up, but what we do with them is what matters most. By being more aware of them it gives me an opportunity to make a conscious choice – Will I let them beat me up or will I practice self-compassion? 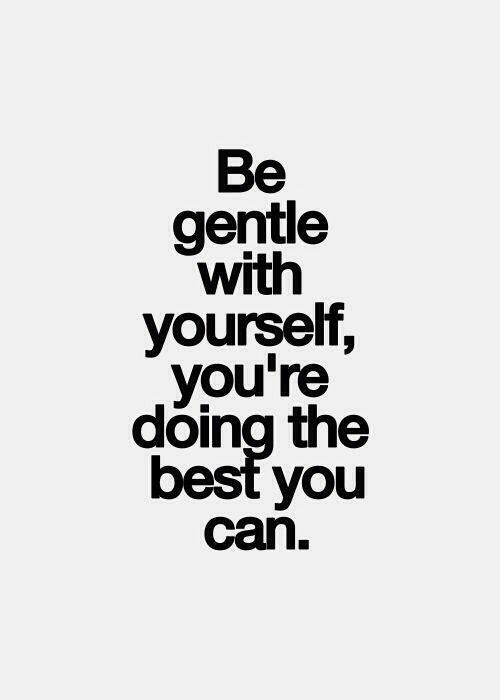 Through my experiences these last few months it has become clear to me how important, and amazing, self compassion is – yet it is still the thing I struggle with most. Kristin Neff explains that self-compassion involves three basic components; self-kindness, common humanity, and mindfulness. Mindfulness helps us notice our own suffering (Awareness is the first step to everything!). Self-kindness is being kind and caring in response to that suffering, and common humanity is remembering that suffering and imperfection is part of the human experience. When it comes to compassion, it is a lot easier to apply to others than it is to yourself. My default (and I’m sure some or all of you can relate) is to judge, harshly. I can easily get into the mind-set that “Sure, I’ll practice self-compassion, but only when I deserve it”. And let me tell you, if you are making yourself “earn it”, it’s not self-compassion. True compassion is non-judgmental. But it’s true what they say, old habits die hard. In an effort to force this into the grave and replace this with compassion I’ve been trying the following strategies. One strategy I use is to visualize myself as a young child. The distance this creates helps me see myself as someone who deserves compassion and protection from the Inner Bully. It sparks a strong urge to protect and comfort that child, which makes it easier to practice self-kindness. Another strategy I try is talking to myself as I would a friend. When I remember to use this strategy the words and tone I use instantly change from my usual self-talk. This again helps with the self-kindness. Self-kindness is by far my most challenging hurdle in the self-compassion triathlon; however, I also find it difficult to remember to extend the common humanity to myself. It’s easy to personalize our struggles and to think we are failing while the rest of the world would be doing just great in our situation. It’s become clear to me that I need a reminder of this (for the times that my healthy tribe are not around). So I wrote myself a message.. I also found a mantra to help remember the keys to self-compassion. Imagine how comforting it would be to know that you always have someone (24/7) that will be compassionate and soothing whenever you are suffering. I’m sure self-compassion will be something I continue to struggle with for a long time, but I know the more steps I take in this direction will make me a stronger person dragon. I’d love to hear any strategies or tips you have for practicing self-compassion! For me, compassion has been something I overlook when it comes to myself even though ive always thought of myself as compassionate. It’s like you said, there is an inner bully that lives inside. Through my own work towards mindfulness, I’ve learnt a bit more about this bully and I have found it is easiest to diminish its voice by imagining someone else. And pretending how would I feel if the same situation was happening to another person. I like your suggestion about the inner child though. That provokes a strong emotion. And is helpful so thank you. I guess this inner bully is so strong because it lacks an audience…. In that no one will know how mean our thoughts are towards our self. Hope your feeling better. Thanks Seashines, feeling much better 🙂 It’s nice to know that you use a similar strategy to help with your compassion practice and I like what you said about not having an audience- I think you definitely are onto something there. Even sharing what my Inner Bully was saying made me feel strange because I don’t like how cruel it makes me look (even though it was to myself). Very interesting point. When I am in need of some self-compassion I try to channel my inner stronger self! What would that person do to make themselves feel better? My favourite go-to’s include: a relaxing bubble bath, some gentle (yin) yoga, and some self-soothing techniques that Dr. Wilson has described (e.g., putting your hand on your chest). And though I am sometimes reluctant to do this one, calling a friend usually makes me feel better. It’s hard to motivate myself into doing this sometimes (when talking is the last thing you want to do), but I invariably feel better after talking to someone in my tribe. It doesn’t even have to be about what your bully is telling you – it can be able anything! I also find that I am more compassionate towards myself when I plan things that show compassion to others. The more you give the more you receive 🙂 That is my scattered list! Thanks for your input MindfulYogi! Self-soothing is definitely a go-to for me too! I am encouraged by your ability to channel your inner stronger self- I’m hoping that I will get better at this with more practice. I find I can do it sometimes but when I’m struggling I need my other (more external) strategies for now. I also find it helpful to talk to tribe, and I think your point about giving is very intriguing and something I should explore too. Thanks again for reading and sharing your strategies!! Sometimes it helps me to physically write out a list of things my strong and healthy self would do. In that way, they’re a little more concrete (I need things like that too when I’m in that “state”) and harder to ignore! Hi MindfulYogi! Congrats on starting your own site! Love the name too! I’ll be following you for sure 🙂 I love that both of our sites are dedicated to the idea of being dragons and building strong and healthy tribes!